BOUND BY NIGHT by Larissa Ione Chat. Spreecast Event! Chat it up with Larissa about her great new series. I read it and it was a fantastic new PNR. You just gotta read! 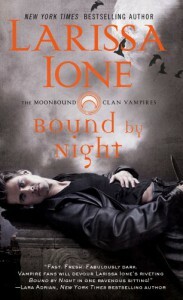 "Larissa Ione has hit another home-run with her new series, named MoonBound Clan Vampire series. A mouthful, but still a good addition to the paranormal romance, science fiction genre of vampire fiction. I had the pleasure of being introduced to Ione through her Demonica series and now she continues her dark creativity with the gem that is BOUND BY NIGHT…a not to be missed read for fans of paranormal romance."